A and I recently spent two and a half fantastic days in Istanbul. We were flying to New York from Hong Kong on Turkish Airlines, and simply arranged to have a very long layover in the city. It was a scandalously short amount of time to spend there, of course, but we had a lot of fun and were able to take in much more than I had anticipated. With the caveat that these were simply our experiences visiting the city for the first time and others may well have better advice, here are some tips for making the most of out a short stay there. We stayed at Levni Hotel, which we picked mainly because of its close proximity to sites in the old city like those listed below. Though we often use friends’ recommendations when picking hotels, we found this one on our own, and were convinced by its many good reviews. The rooms were tidy and ours had a nice view of the Bosphorus. The staff — especially those at the concierge desk — were extremely helpful in providing advice on navigating the city. Another approach, when choosing hotels in Istanbul, is to stay on the Asian side of the city, which makes sense if you want to explore that area more. But we figured given the short amount of time, it was better to be in the middle of the more historical zone, on the European side. Sultan Ahmed Mosque, known as the Blue Mosque, is strikingly beautiful. Not far away is Hagia Sofia, a building with a remarkable history. I was somewhat awe-struck to be able to stand just a few feet away, for example, from the Omphalion — the very place where emperors of the Eastern Roman Empire were once crowned. The Grand Bazaar is incredible: densely packed, enormous, teeming with activity. An excellent shop, if you’re looking for souvenirs like pestemal (towels) and soaps, is Abdullah. The Spice Bazaar is also worth a visit. One evening I walked from the hotel down to the Galata Bridge, where people were strolling about, fishing, and chatting. It offers a nice persepctive from which to take in the city. One evening we took a taxi to Istiklal Avenue, a long street that is blocked off for pedestrians. It’s a great place to wander around and people watch. I’m a sucker for views, so we went to a rooftop bar called 360 Istanbul to watch the sun go down over the city (see the image in the middle of this post). The service was…well, not great. But the vistas sure were. For simple, down home Turkish fare, you might try Ficcin. It’s just off Istiklal Avenue, not far from 360 Istanbul. We sat at a table on the street, which was quite atmospheric. 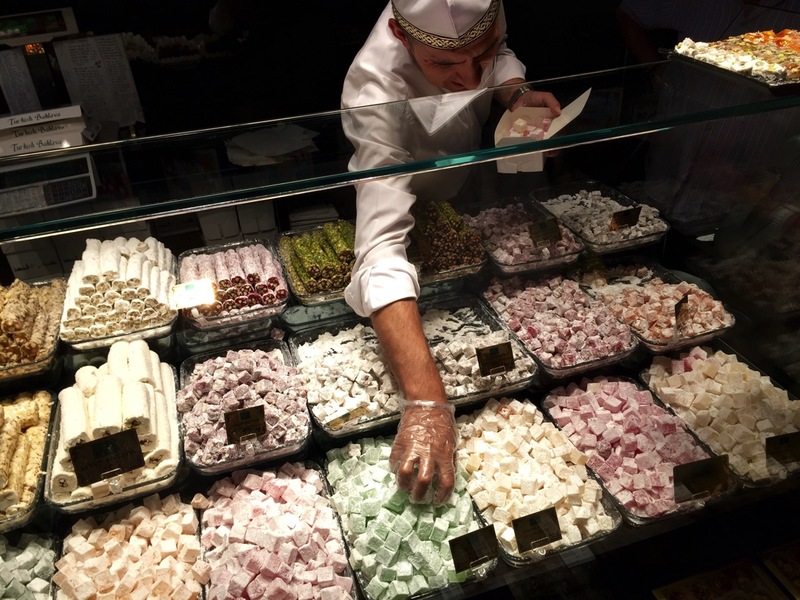 For Turkish delight and other sweets, check out the storied Hafiz Mustafa 1864, near the Grand Bazaar, pictured above. More info here and here. We had an enjoyable lunch of kebabs at Buhara Restaurant, in the old city. 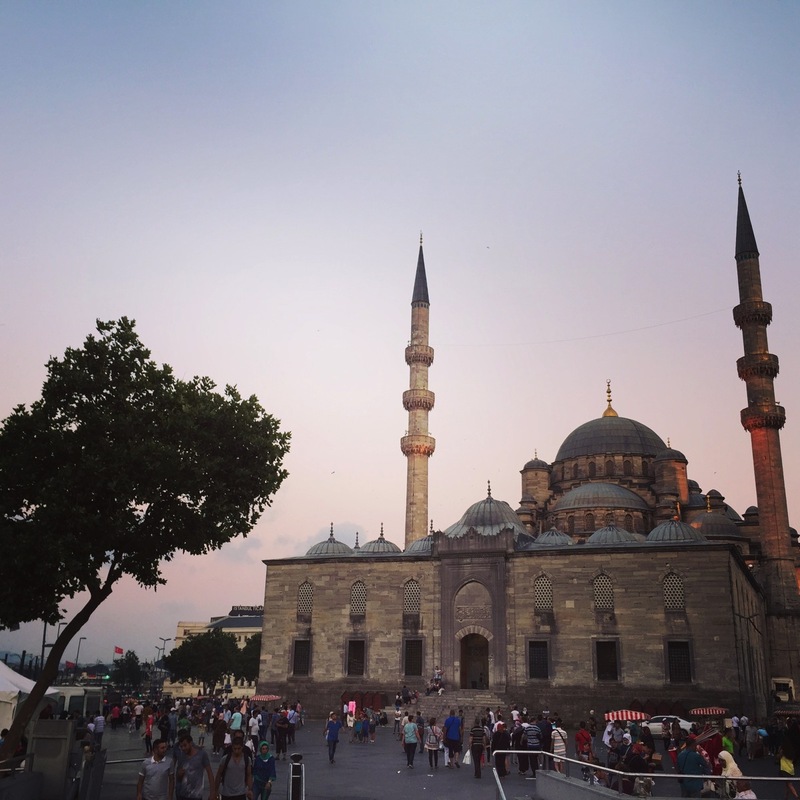 The blogger Gotham Gal has several posts about visiting Istanbul on a four-day trip. 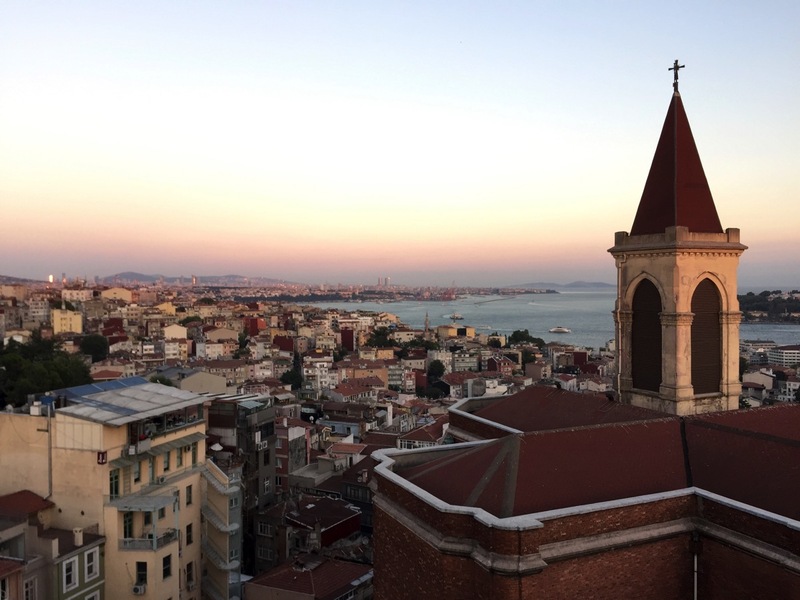 “So you’re visiting Istanbul: read this,” by Meg Nesterov, offers some good tips.